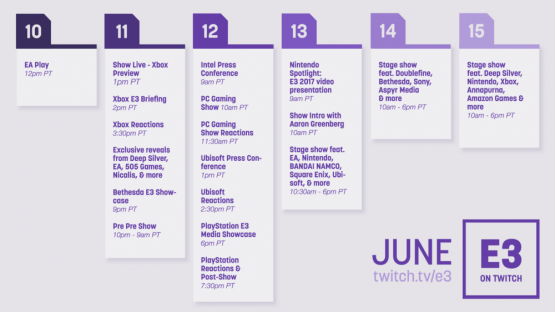 Twitch has revealed their E3 2017 livestreaming schedule, which features six days of content, including all of the press conferences, exclusive reveals, and 8-hour stage shows. Twitch’s coverage of the main press conferences will be available in HD quality with a closed caption option. Everything starts on Saturday, June 10 at 12pm PT/3pm ET with the EA Play showcase, then continues on Sunday, June 11 with the Microsoft press conference, Bethesda press conference, and exclusive reveals from Deep Silver, EA, 505 Games, Nicalis, and more. As for the Ubisoft and PlayStation press conferences on Monday, June 12, Twitch says each will run for 90 minutes. For the rest of the week, you’ll find Nintendo’s E3 presentation as well as stage shows featuring Sony, Square Enix, Ubisoft, Bandai Namco, and others. 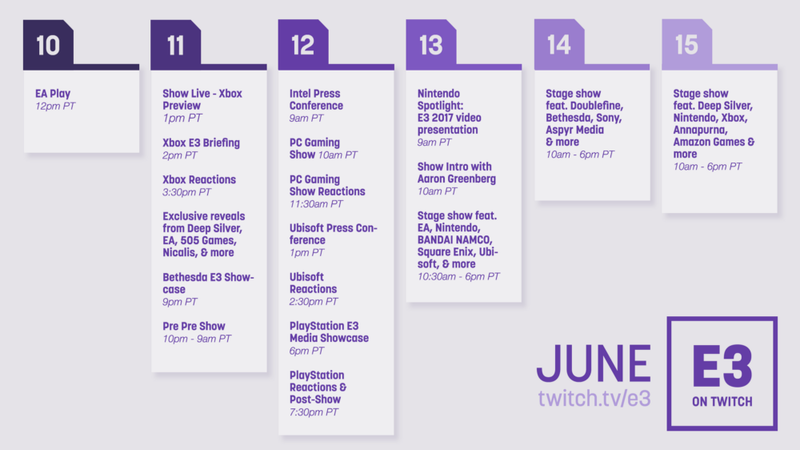 Additionally, Twitch will be covering Geoff Keighley’s E3 Coliseum from June 13 to 14 on Twitch.TV/TwitchPresents.